AP/More than 100 other migrants were rescued from an inflatable dinghy off Libya’s coast on Wednesday. At least 3,800 migrants have died or are missing in the Mediterranean Sea in 2016 — the deadliest year on record, the UN refugee agency (UNHCR) has said. 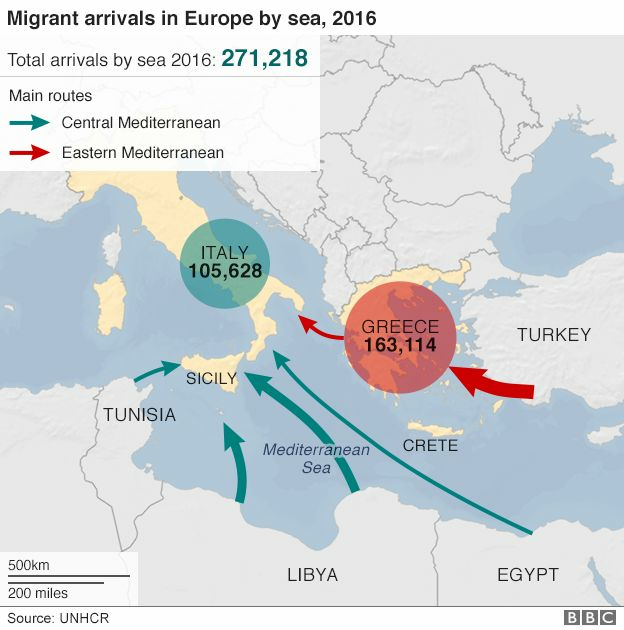 It said this was despite a significant drop in migrant crossings compared with 2015, when 3,771 deaths were reported. Smugglers were now more often using flimsy boats and putting more people aboard, the UNHCR said. The report came as 25 bodies were found in a partially flooded inflatable dinghy off Libya’s coast on Wednesday. More than 100 other migrants were rescued from the boat by Medecins Sans Frontieres, the aid agency said. The agency said the most dangerous route had been between Libya and Italy, with one death in every 47 arrivals recorded. By comparison, another — much shorter — route from Turkey to Greece had a ratio of 1 in 88. Fewer migrants were using the latter route after Turkey and the European Union reached a deal on how to tackle the issue earlier this year, the UNHCR said. Nearly 330,000 people have crossed the Mediterranean Sea this year, compared with more than one million in 2015. Some migrants are seeking economic opportunities in Europe — others are fleeing war, instability or authoritarian governments.